The Thai Flying Club Membership Card and "IAOPA Crew Card" is very useful if you are flying Internationally or to different airports in Thailand. The card has your photo and license details on it and allows you access to the airport apron. Crew Cards also entitle you to Crew Discounts at certain hotels. A Crew Card can be replaced easily if it is lost, whereas a Pilot's license takes longer to replace. 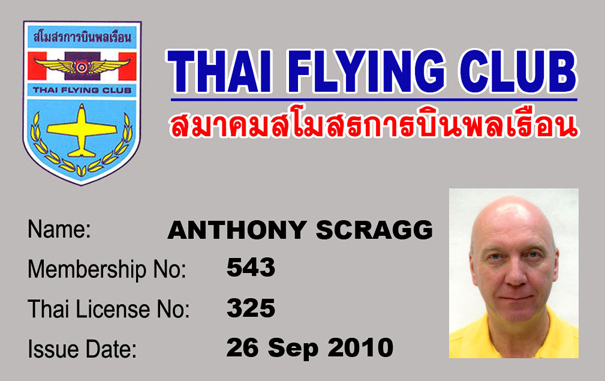 Contact the Thai Flying Club if you would like to get your pvc plastic IAOPA Crew Card. Cost is 300 Baht. We need your -- 1. Name, 2. Membership No., 3. License No., 4. JPG Photo, 5. We will start after receipt of your 300 Baht. OPTIONAL: You can order your TFC Crew Card right now by credit card. We will make it immediately and ship it to you by mail.